SILVER KNOCKOUT METALLIC R-CODE BLACK Extra color cost. The available R-Code adds differentiation with a black-painted roof and side mirrors. SILVER KNOCKOUT METALLIC Extra color cost. The available R-Code adds differentiation with a black-painted roof and side mirrors. RUBY FLARE PEARL Extra color cost. BLUE ECLIPSE METALLIC R-CODE ICEBERG Extra color cost. The available R-Code adds differentiation with a black-painted roof and side mirrors. RUBY FLARE PEARL R-CODE BLACK Extra color cost. The available R-Code adds differentiation with a black-painted roof and side mirrors. BLUE FLAME R-CODE BLACK Extra color cost. The available R-Code adds differentiation with a black-painted roof and side mirrors. BLIZZARD PEARL R-CODE BLACK Extra color cost. The available R-Code adds differentiation with a black-painted roof and side mirrors. 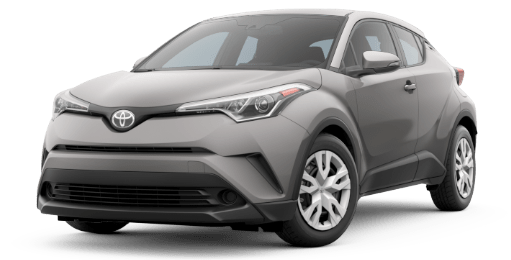 Distinctive style meets rebellious spirit in the 2019 Toyota C-HR. Take center stage effortlessly with a precision-cut design that shines from every angle. Perfectly complementing Toyota C-HR's unique design are black, machined 18-in. sport alloy wheels. The vortex-style design expresses C-HR's desire to perform while emphasizing its powerful stance. Shine a light on Toyota C-HR's edgy design with distinctive LED Daytime Running Lights (DRL) and light up the road ahead with bright halogen headlights. 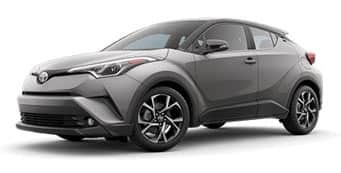 Sitting atop the raked rear window is an integrated rear spoiler that adds an extra touch of attitude to Toyota C-HR's unmistakable silhouette. Toyota C-HR's Limited model features leather-trimmed seats that add to its premium feel while also firmly supporting you around every corner. Take hold and take control. Toyota C-HR features an available premium leather-trimmed steering wheel and standard satin-plated shift knob, giving this cabin the perfect blend of elegance and sportiness. You’re cool. But your friend likes it warm. Well, with Toyota C-HR’s standard dual zone automatic climate control system, you both can have it your way and ride in total comfort. Toyota C-HR's sport front bucket seats come with an available heating feature that helps you stay cozy when the temperature starts to drop. 2Disclaimer for MPG: 2019 EPA-estimated mileage. Actual mileage will vary. 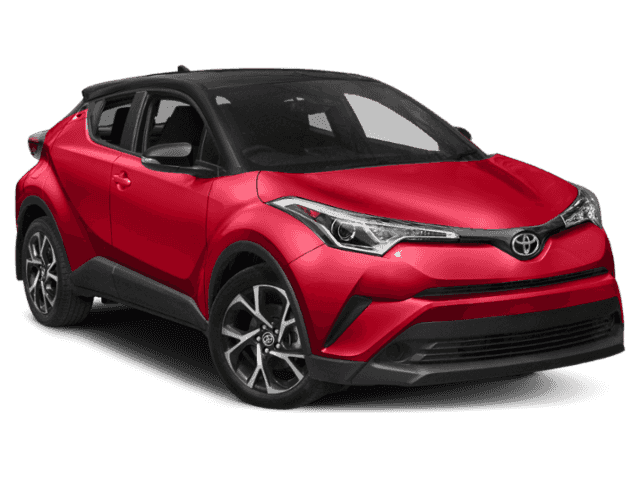 Transforming Toyota C-HR's horsepower into forward motion is an advanced Continuously Variable Transmission with intelligence and Shift Mode (CVTi-S). Put it in "D," and it does all the work, giving you a smooth and efficient drive. When you want more control, its Sequential Shiftmatic™ Mode lets you manually shift between seven virtual gears. Toyota C-HR's innovative MacPherson strut front suspension has angled strut bearings and a large-diameter stabilizer bar to help the front end respond quickly and precisely, so you can take on those corners like a pro. And at the rear, the multi-link suspension utilizes shock absorbers with urethane upper supports to help C-HR deliver a comfortable ride when cruising through the city. It's easy to take in the sights when you're in the sport-inspired driver's seat of C-HR. A tall seating position and wide windshield work together to give you a clear view of what's ahead, helping you stay ready for whatever the road may bring. 4Disclaimer for CarPlay: Apple CarPlay® is a registered trademark of Apple Inc. Apps and services subject to change at any time without notice. Inside the gauge cluster is Toyota C-HR’s standard 4.2-in. TFT Multi-Information Display, designed to give you all of your go-to information at a glance. See your average mpg, outside temperature, driving modes and trip information. Toyota C-HR's outside mirrors include an auto-folding feature. Just press a button, and the mirrors fold in. These mirrors also fold in automatically when the doors lock. And to increase safety, these mirrors can warm up to help provide a clear view during cold drives. 5Disclaimer for pocket or bag: The Smart Key System may interfere with some pacemakers or cardiac defibrillators. If you have one of these medical devices, please talk to your doctor to see if you should deactivate this system. Don’t get taken by surprise. By illuminating a warning signal on the outside mirror, the available Blind Spot Monitor (BSM)6 and Rear Cross-Traffic Alert (RCTA)7 help identify vehicles that you may not see when changing lanes or backing out of a parking space. 6Do not rely exclusively on the Blind Spot Monitor. Always look over your shoulder and use your turn signal. There are limitations to the function, detection and range of the monitor. See Owner’s Manual for additional limitations and details. 7Disclaimer for RCTA: Do not rely exclusively on the Rear Cross-Traffic Alert system. Always look over your shoulder and use your mirrors to confirm rear clearance. There are limitations to the function, detection and range of the system. See Owner’s Manual for additional limitations and details. Included in the standard 8-in. color display is an integrated backup camera8 that helps you see what’s behind you. 8Disclaimer for camera: The backup camera does not provide a comprehensive view of the rear area of the vehicle. You should also look around outside your vehicle and use your mirrors to confirm rearward clearance. Environmental conditions may limit effectiveness and view may become obscured. See Owner’s Manual for additional limitations and details. Toyota C-HR has ten standard airbags for you and your crew.9 Those include a driver and front passenger Advanced Airbag System, driver and front passenger seat-mounted side airbags, driver knee airbag, rear seat-mounted side airbags, front passenger seat-cushion airbag, and front and rear side curtain airbags. 9Disclaimer for crew: All the airbag systems are Supplemental Restraint Systems. All airbags (if installed) are designed to inflate only under certain conditions and in certain types of severe collisions. To decrease the risk of injury from an inflating airbag, always wear seatbelts and sit upright in the middle of the seat as far back as possible. Do not put objects in front of an airbag or around the seatback. Do not use a rearward-facing child seat in any front passenger seat. See Owner’s Manual for additional limitations and details. Every Toyota C-HR is built with our Star Safety System™, an advanced integration of active safety technologies designed to enhance traction, braking and more. Armed with these active safety features, C-HR helps you avoid accidents in the first place. Not every car provides this level of safety, just every new Toyota. 3The backup camera does not provide a comprehensive view of the rear area of the vehicle. You should also look around outside your vehicle and use your mirrors to confirm rearward clearance. Environmental conditions may limit effectiveness and view may become obscured. See Owner’s Manual for additional limitations and details.